Santa Barbara became the center of the movie-making world when the Chicago-based American Film Manufacturing Company opened the largest production facility in the country in 1913. Known as the Flying A due to its winged logo, the studio produced over twelve hundred films. This 35 mm camera was used by Robert Phelan (1888-1966) during his years as a cameraman at the Flying A studios. 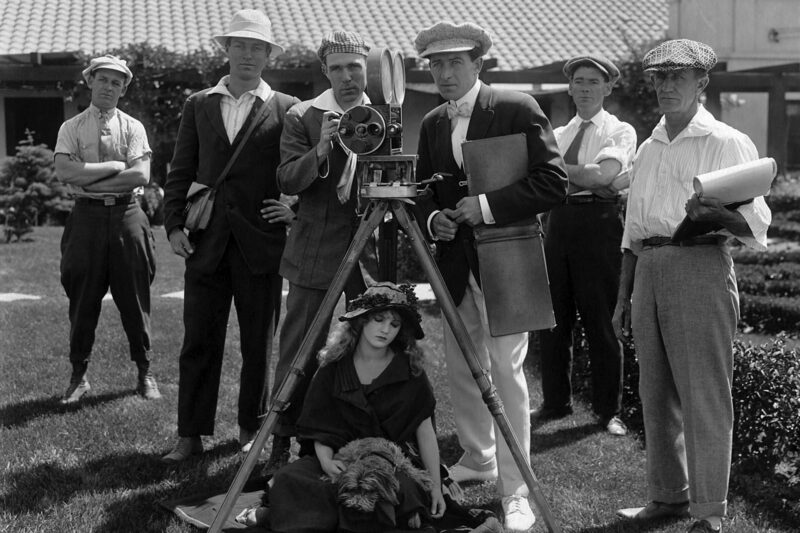 To operate, the film had to be advanced at the rate of one-foot per second, which required two turns of the crank. Cameramen were known to achieve this rate under the most trying of circumstances. While the 1920s brought to Santa Barbara a cultural awakening to its Spanish and Mexican heritage, the 1925 earthquake presented civic leaders with a “clean slate” upon which to rebuild the city. Since then, the Spanish Colonial Revival style has mixed with cues of Mediterranean origin and created buildings of white walls and tile roofs, with iron accents in balconies, light fixtures and window grilles. This melding of architectural elements became known as the “Santa Barbara Style”, and is predominant throughout the city today, as seen in the Arlington Theatre and Casa del Herrero. Santa Barbara’s Old Spanish Days Fiesta was instituted in 1924 to celebrate the community’s Spanish and Mexican heritage. The festival takes place the first week of August and attracts thousands of visitors from all over the world. The annual event consists of five full days of festivities, which include open-air marketplaces, nightly entertainment, a children’s parade and a western rodeo. The highlight is the historical parade, which features costumed riders on horseback, floats with historic themes and flower-bedecked carriages. A chief airframe engineer for Loughead Aircraft in Santa Barbara, John K. Northrop honed the aeronautical engineering skills that made his designs some of the most influential of all time. Upon graduation from Santa Barbara High School, Northrop was employed by the Loughead brothers in 1916 to design the wing structure of their new F-1 seaplane. Here at Loughead, Northrop created his first aircraft, a sport biplane designated the S-1 that incorporated extensive streamlining and an innovative monocoque fuselage. After relocation to Burbank in 1927, Northrop designed the Lockheed Vega, a sleek civilian aircraft based on the S-1 that broke numerous records in the hands of Amelia Earhart and many others. One year later, Northrop founded his own company and produced the Alpha. This revolutionary design first utilized the all-metal, semi-monocoque fuselage and stressed-skin, multi-cellular wing structure that are the basis of contemporary aircraft. During the Second World War, Northrop focused on his true aeronautical passion, a series of highly efficient “flying wing” aircraft that culminated fifty years later in the modern Northrop-Grumman B-2 Stealth Bomber. After the 1925 earthquake severely damaged the Santa Barbara Mission, a statewide fundraising drive was organized by local rancher Dwight Murphy (1884-1968). In addition to donating a significant sum himself, the public subscription program was a tremendous success. The newly restored “Queen of the Missions” was formally consecrated during a three-day celebration in December 1927. In gratitude, the Franciscans at Mission Santa Barbara presented Dwight Murphy this painting by Alexis Podchernikoff, who was noted for his landscapes of the Montecito area. Over the last century, the Lockheed name has become synonymous with great aircraft and innovation in aviation. As teenagers in the San Francisco Bay Area, Allan and Malcolm Loughead taught themselves to fly in the pioneering era before flight instruction had become practical. In 1916, they relocated to Santa Barbara and founded the Loughead Aircraft Company, and along with Santa Barbara native Jack Northrop, the brothers began work on the largest flying boat in the world at that time, a ten-passenger seaplane dubbed the F-1. Seen here is their first aircraft, the Model G, on the ramp in front of the Potter Hotel at West beach with the Model F-1.